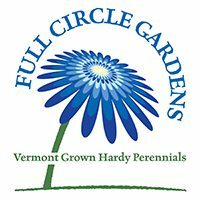 Full Circle Gardens is a nursery in Essex, Vermont, that specializes in sustainably-grown native and pollinator-friendly perennials. We believe our sustainable growing practices lead to long-lived plants that transplant well. We carry a wide variety of native cultivars, pollinator-friendly perennials, rain garden plants and green roof sedums and sempervivums as well as classic landscape varieties. From the road, we may look like a small operation, but thousands of plants are hiding behind our barn waiting for your garden!